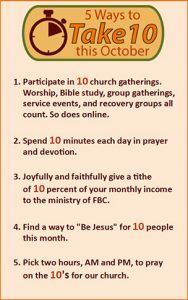 A few weeks ago I challenged each of you to “Take Ten” as we prepared to enter into this, the tenth month of the year. In case you forgot, here’s the five tens that could change a lot of things for the good in a short order of time. Well, how are you doing? The hardest one for me is the prayer for the church on the tens. (Kind of like the weather channel does local on the eights, or at least I think they still do.) Ten minutes one time a day focused on prayer and devotion may seem easier, but we are still forced to be intentional – and be still. Alas, our world is not known for either. I’ve pretty much got my participation trophy for good gatherings (yes, I do confess to a vocational advantage). Being Jesus for ten is heartwarming as we claim those chances. And the challenge has at made me surprisingly aware and regretful for the opportunities I missed or passed up. The last one is perhaps the easiest and the hardest. Tithing is easy because you only have to think of it once or so and we can check it fulfilled and fulfilling when we have. It’s harder because of the demands we have and the sometime honest truth that we would just rather do something else with it. And it is the one goal that you can make up for month’s missed chances and is totally up to us to act upon. My prayer is that we all will, especially those of us who have not tested and proved God in this faith arena. These are pivotal and challenging days in the life of FBC, particularly in regards to finances. Our hope is that this month can be a barometer of our commitment and capacity to give to the Lord’s ministry. A lot of decisions that we make in the days ahead will be informed and influenced by how we finish October. To date, it has not been more noteworthy than normal. It still can be, and honestly, it still needs to be. Remember you can give not only through the offering plate but online through our website or bill pay. I implore all of us to consider what God has blessed you with and then, joyfully, boldly, and faithfully “take ten” for the good of the church and the kingdom. And our hearts and souls.